Targum Yonatan, and the Sifra both identify tzahov with a type of zahav זהב - gold. 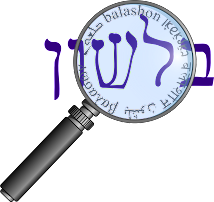 The Malbim and the Torah Temima both explain that identification by the similarity between the two words. Klein also writes that the two are related. Rav Saadia Gaon and the Ibn Ezra give a different explanation for tzahov. Rav Saadia Gaon translates אצהב, and Ibn Ezra explains that in Arabic this is a very light color, approaching white. The Or HaChaim, who also knew Arabic, has a very hard time accepting the Ibn Ezra's approach, and is unwilling to reject the Sifra's explanation of zahav. He goes so far as to say that explanations such as these are what caused the Ibn Ezra to be not taken seriously by the rabbis over the generations. The verb צהב means "to be bright, to shine". Interestingly, two other verbs beginning with the same two letters have the same meaning - צהל and צהר, but I have not found anyone who connects the three. According to Rosenthal, besides having an association with yellow journalism, tzahov also indicates fans of Maccabi Tel Aviv.